The Lakers and Spurs dominated the headlines last week. The Spurs had "Restgate" where Coach Popovich decided to send home 4 of his top players before the Spurs played the Heat last Thursday on national TV. David Stern did not like that gesture one bit and he decided to slap "substantial sanctions" to the Spurs in the form of a $250K fine. As for the Lakers, they continued to struggle winning games. Kobe has started to question his teammates (especially Gasol) and Steve Nash is still out with an injury. More bad news for the Lakers, backup PG Steve Blake could be out 2 months after he had surgery on his torn abdominal muscle. Gasol also has knee tendinitis which could make him miss more games. The standings are current up to December 4. The rankings from last week refer to Week 4. 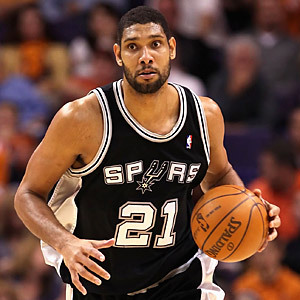 Tim Duncan is leading the Spurs this year. Coach Pop knew what he was doing when he didnt play Duncan and company. But was it worth the fine that the commish gave them? The Spurs got a fortunate non-call that worked in their favor in their win versus the Grizzlies. Tim Duncan has defied his old age by putting up vintage Duncan numbers: 19 and 10. The Spurs have another chance to compile a wining streak, up next: Bucks, Rockets (2x), Bobcats & Jazz. The Grizzlies had a chance to be the undisputed top team in the West for another week if they defeated the Spurs. They choked the game away after being up by 14 in the 4th quarter. The Grizzlies have lost 5 straight versus the Spurs dating back to last season. They have yet to beat the Spurs after upsetting them in the 2011 playoffs. Zach Randolph continues to play great. He had video game numbers vs the Suns: 38 points and 22 rebounds. The Thunder has the current longest winning streak at 6 games. They have the biggest winning margin at +9.6 and they lead the NBA in scoring. Russell Westbrook is averaging a career-high 8.7 assists and taking less shots this year. Kevin Martin has been great off the bench with 16 a game while Serge Ibaka is off to a career-high 14 ppg with a midrange jumper. BTW, Kevin Durant leads the team in rebounding. The Knicks are entering a difficult stretch after their game vs the Bobcats on Wednesday. They will be playing against 5 playoff caliber teams that starts with the Heat and ends with the Lakers. Raymond Felton could miss games due to an injured thumb while Jason Kidd is also injured. Meanwhile, Amare has been rumored to be back by Christmas Day in time to play the Lakers. The Heat has been playing down to the level of their competition in the last two weeks. They almost lost to the Spurs "B" team and they were trailing the Nets without Brook Lopez by 14 points. They finally lost to a team (Wizards) that had no business in beating them. The worst in the East beat the champs. Their defense was awful in letting the worst team in scoring reach 105 points. The Heat is playing the Knicks on Thursday, will we see a motivated and focused Heat team then? The return of Chauncey Billups 3 games ago has coincided with the Clippers winning 3 straight after dropping 4 straight. Blake Griffin is averaging career-lows in points and rebounds but his minutes are also down due to the Clippers being among the deepest team in the NBA. DeAndre Jordan has a bigger role in their offense, career-high 10 ppg. Jamal Crawford continues to lead them in scoring by the smallest of margins. The Nets managed to compete with the Heat and Thunder even without their leading scorer (Lopez). They lost both games to last year's finalists but they came away optimistic and with confidence. Andray Blatche has been fantastic in his last 4 games: 17.5 points and 10 rebounds in under 30 minutes. The Nets signed him for less than a million dollars. The Warriors went 3-1 last week with impressive wins over the Nuggets, Pacers and T'wolves. Steph Curry has been amazing in his last 3 games where he recorded 3 straight double-doubles (22 ppg & 11 apg). His shooting is still off at 42% and that will probably improve in the coming games. Harrison Barnes has cooled down lately only scoring a total of 17 points and 11 rebounds in his last 3 games. The Hawks had a pretty soft 2-game schedule last week where they played the Bobcats and Cavs. They escaped the Bobcats but lost to the Cavs. The next few games get tougher with meetings against the Nuggets, Grizzlies and Heat. It's surprising to learn that the Hawks are 29th in rebounding even with players like Horford, Pachulia and Smith. Between the 3 of them, they get around 25 rebounds out of the 39 that the team averages. The Rockets lost big in OKC during Harden's return. They followed that up with impressive wins over the Jazz and Lakers. Harden has struggled offensively in his last 3 games (34% shooting) including going 3-19 vs. the Lakers but the Rockets won, thanks to their bench. Greg Smith and Toney Douglas combined for 43 points to erase a 13-point Lakers' lead in the 4th quarter. The Sixers still struggle to score (28th in scoring) but they manage to take care of the ball well (2nd in least turnovers a game). Jrue Holiday is playing like an all-star while Evan Turner and Thad Young continue to improve on both sides of the floor. The Sixers will have a home and home series with the Celtics next. Winning both games would put them 2.5 games ahead of the Celtics in the standings. Rajon Rondo ended his assists streak by getting ejected. He was suspended for 2 games while the Celtics went 1-1 without him. Rondo needs to be careful because another infraction with the NBA could cost him at least 5 games. There's no way the Celtics can survive without Rondo. The Celtics are already last in the league in rebounding. The last thing they need is to lose the best rebounding point guard. The Pacers finished their 4-game road trip at 3-1. They had nice wins vs. the Lakers and Bulls in that stretch. They have played 12 of their 18 games on the road without Danny Granger so their .500 record is good enough for now. Paul George continues to have an inconsistent season. He scored 4 points vs the Kings, zero against the Warriors, then he erupted for 34 against the Bulls. The Pacers need him to pick up his scoring since Hibbert continues to struggle. The Nuggets have been consistent in having streaks. They lost 3 straight before beating the Raptors. They now embark on a 5-game road trip with a chance to have a longer winning streak. The Nuggets are 29th in free throw shooting with Ty Lawson having the biggest drop from last season (82% to 59%). Kenneth Faried has been great with 9 double-doubles already. Ricky Rubio might be back by the end of December. The T'wolves are starting to get healthier. Even JJ Barea is back from his injury. New addition Josh Howard had a good game vs the Sixers (16 & 10) while rookie Alexey Shved has been great off the bench in his last 3 games (17 ppg & 3 apg). Kevin Love already has 6 double-doubles in 7 games played. The Bulls have picked up their defense and they now rank 3rd in the league in points allowed. Nate Robinson continues to be a spark off the bench. There are indications that Derrick Rose might come back early from his injury. He is already doing running and shooting drills. The Central division is tight right now so if the Bulls can stay close to the top, D-Rose might make his comeback sooner rather than later. The Bucks went 1-3 last week with the lone win coming against the Celtics without Rondo. Larry Sanders had a triple-double with blocks but the Bucks lost that game. Sanders has 22 blocks in his last 3 games. Ersan Ilyasova continues to be inconsistent after signing a contract this past summer. In his past 4 games, he scored 18, 0, 15, 2. He is averaging only 7 ppg and 5 rpg (Last Year: 13 & 9). OJ Mayo still lead the Mavs in scoring but he has cooled down in the last 5 game averaging 16.4 and shooting 43%. The Mavs are struggling with their point guards lately (Collison and Beaubois) that they signed veteran Derek Fisher (38 years old) and placed him in the starting lineup immediately in his first game. Fisher played 24 minutes and shot 1-8 with 3 assists. The Lakers are 6-0 when Kobe scores 25 or less and 2-10 when he shoulders the scoring. Pau Gasol is hurt with knee tendinitis and Steve Blake will be out 2 months after surgery. The Lakers are last in the league in turnovers and free throw shooting. Rumors have floated that Gasol is already on the trading block. The Lakers are 0-3 in games decided by 3 points or less. Too much hero ball by Kobe? The Jazz have lost 3 straight to potential playoff teams. They lost their first home game to the Clippers by a point. Al Jefferson has been very efficient and he leads the team in points and rebounds. Paul Millsap has somewhat taken a back seat, averaging just 12 and 7.6 rebounds in his last 5 games. Marvin Williams is still injured with a concussion and the Jazz miss his 10.4 points and perimeter shooting. The Magic started their 5-game road trip with a huge win over the Lakers then they followed that up with a win over the resurgent Warriors. Their win over the Lakers could be their biggest of the season. It certainly had the most meaning for the team and their fans. Arron Afflalo has been huge offensively in their last 2 wins: 27 points, 5 rebounds and 3 assists. The Blazers won their last 2 games both in overtime and they scored 118 on both games. Those games came against the Cavs and the Bobcats. Their bench has not contributed much which left the starters play around 45 minutes in both overtime games. They are currently 2-4 on their 7-game road trip with the last game against the Pacers. Then, they will have 6 straight games at home. The Bobcats have now lost 4 straight games after their impressive 7-5 start. Their next 6 games will be against playoff teams so a win or two would be a big boost to their confidence. Plus, win #8 should be reason to celebrate. Byron Mullens has been good this year (13 & 8) but his shooting needs work at 37%, a product of taking more perimeter shots. The Suns have lost 4 straight including a total no-show against the Pistons where they lost by 40 points. Everyone is struggling right now except Goran Dragic who continues to play well and Shannon Brown who has done well as a starter. Marcin Gortat and Luis Scola are doing worse than last season. Jared Dudley and Michael Beasley are shooting bricks. Their defense needs a lot of improving since they are last in the league and the only way to go is up. The Pistons have been okay at home with a 5-3 record. On the road is a different deal where they are 1-10. Kyle Singler has been decent since he was named a starter. Jason Maxiell has been a dominant defensive force, getting 13 blocks in his last 3 games. Forgotten on the bench is Corey Maggette who is only getting 15 minutes and averaging 6 points. The Hornets could be renamed Pelicans by next year. They continue to miss the presence of Anthony Davis who has only played 6 games. He might be out another week. Austin Rivers has lost his starting spot (6 ppg, 30% shooting) to Roger Mason who has not been doing that much better (6 ppg, 41% shooting). Ryan Anderson and Robin Lopez have been great offensively. The Raptors continue to play close games in the clutch. They went 1-1 in games decided by 5 points or less last week. They are 2-7 in games that either forced overtime and were within 5 points. They embarked on a 5-game road trip out West and they already lost to the Nuggets by 3. Two of the remaining four road games are winnable (Kings & Blazers). The Raptors need to start winning right now if they still want to make the playoffs. Another injury to their backcourt of the future has hurt the Cavs in the standings. Kyrie Irving is still out with a finger injury and now, Dion Waiters is out with a sprained ankle. Jeremy Pargo and Omri Casspi have been inserted into the starting lineup. Anderson Varejao continues to sparkle for the Cavs. He should be an all-star starter. His last 5 games: 18 points and 19 rebounds. The Kings are currently the worst in the West. Tyreke Evans has missed his last 2 games due to knee problems, both losses. That came at such a bad time since Evans was starting to get his rhythm back. The Kings have played 10 of their 16 games at home but managed to only go 4-6 in Sleep Train Arena. The Kings are the only other team without a road win, just like the Wizards. They are still the worst team in the league but they beat the champs! If the Wizards can play with that focus and energy on every game, they can win a few more games. John Wall is still injured and they are uncertain when he can return to action. Wall was supposed to be back last week according to the timetable that the Wizards prepared but he still cannot practice.It could be another 2 weeks before his return. The wizards might be 2-20 by that time.